Not satisfied with passcode or fingerprint scanner protecting your Galaxy phone? If so, you might be in luck when the Samsung Galaxy Note 7 arrives, as several leaked images of the device appear to reveal an iris scanner. Lenses appearing to house the biometric security measure can be seen in a series of pictures uploaded via Twitter by Steve Hemmerstoffer, a leaker with a proven track record, such as predicting both the iPhone SE and the iPad Pro. An abundance of sensors on the front face of the leaked prototype leads us to believe that at least one is the device's oft-rumored iris scanner. A faceplate tipped us off to a possible iris scanner on the Galaxy Note 7 earlier this month, but seeing the phone form into something more complete helps confirm those suspicions. While forward-thinking of Samsung and a first for the Galaxy lineup, iris scanning has made its way to smartphones before, most notably the Lumia 950 XL. 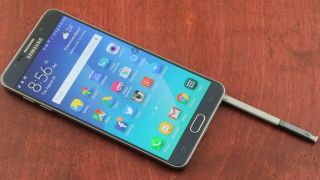 The feature isn't as popular as scanning your fingerprint yet, but could take off using the better-known name of Samsung's phablet line.